First we are going to need to dip dye the paper doilies. Now let me save you some trouble after much Google searching this subject online. It’s A LOT more complicated than the online instructions make it out to be. 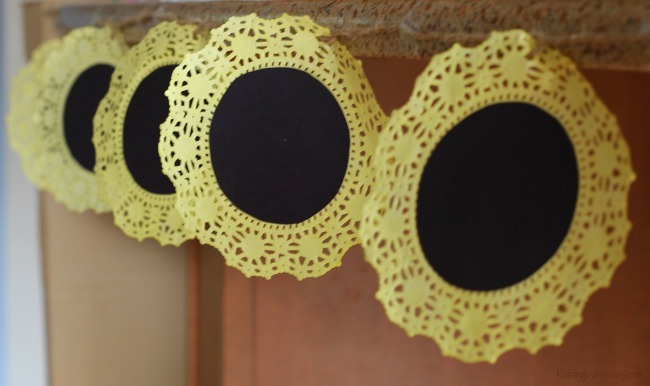 Grab the number of paper doilies you want to use for your banner (think your child’s name in letters, or happy birthday, etc.). Lay out beside a bunch of ready to go paper towels on a plate. 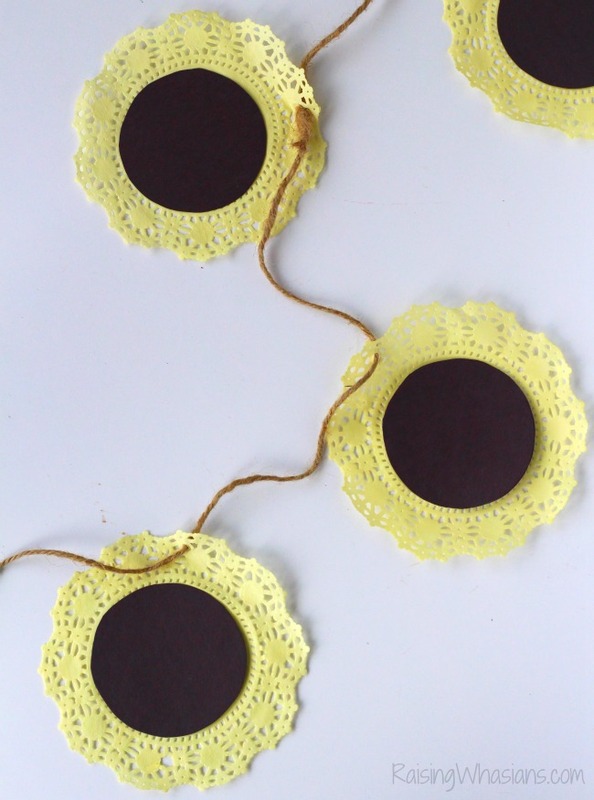 Grab a shallow dish of water (just enough water to cover the doilies when submerged). Add food coloring – a BUNCH. I used about 20-25 drops to get the deep yellow color I desired. You may want to use more or less. Stir. Put on your gloves. 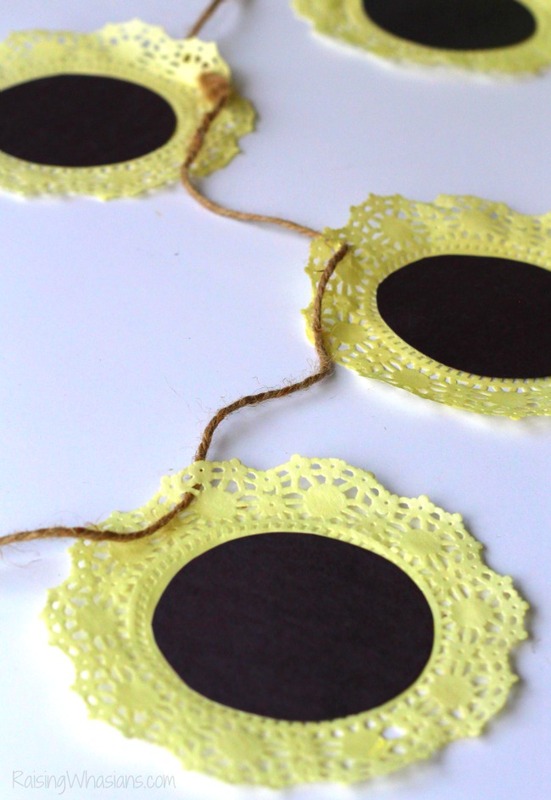 Submerge your doilies (doing only a few at a time) for a full 3-4 minutes. Check the color. If done, place on a plate lined with paper towels and blot dry to keep it’s shape. Be careful to not tear the paper as it will be fragile. Allow to dry fully laying flat. 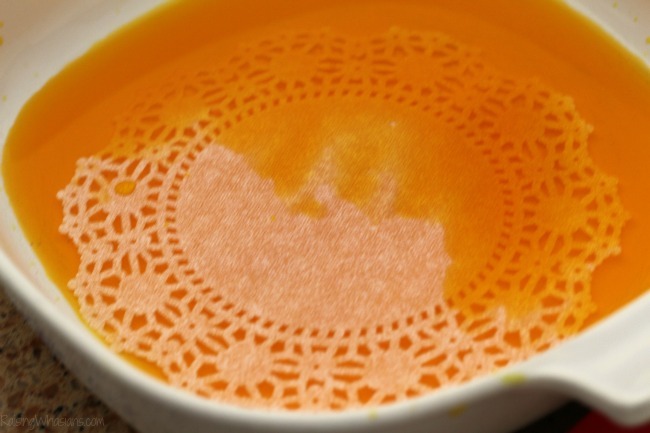 When dry, get out your circle stencil set (or in my case the bottom of a measuring cup) that fits inside the center of your doily without covering up the pretty edges. Trace and cut out the paper. 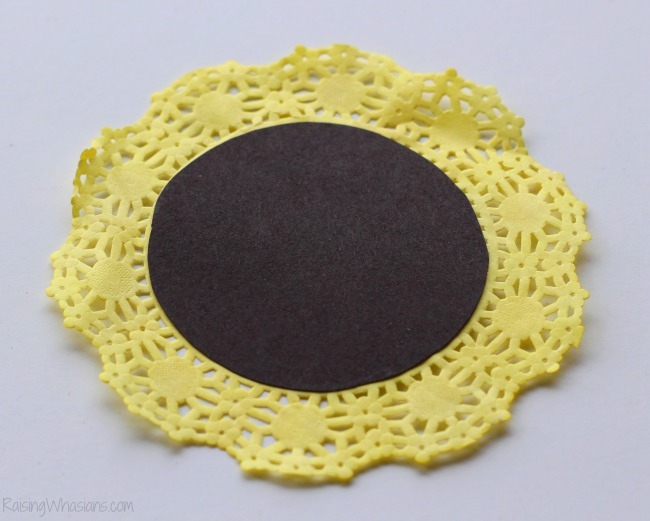 Glue to the center of the doily. 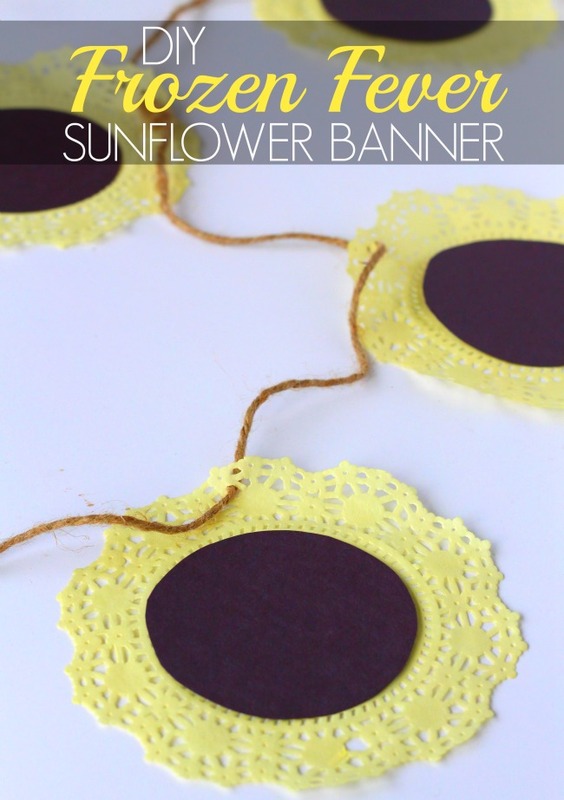 Carefully thread the sunflowers with the jute. 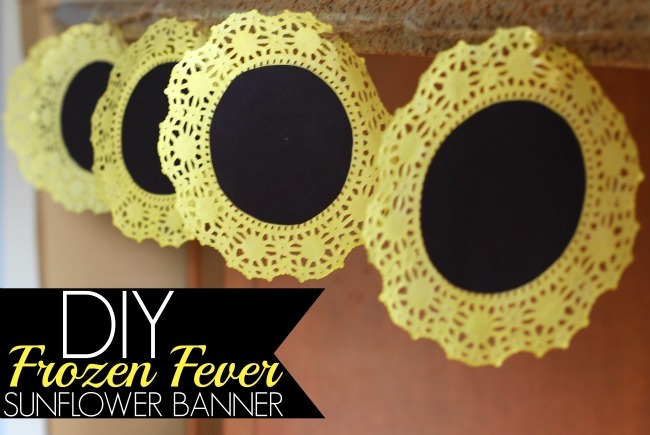 Hang up to display for your spring party…or in my case a Frozen Fever party! Looking for more Frozen Fever party ideas? 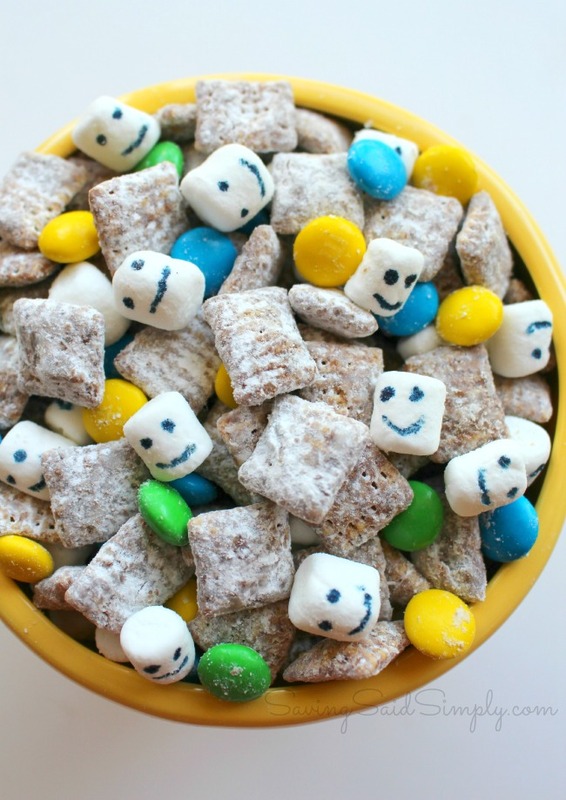 This Frozen Fever Inspired Chex Mix is definitely popular! And be sure to check out my other DIY Disney Parties! We loved the delicate addition of this pretty Frozen Fever inspired Birthday Banner, all for under $3! These sunflowers definitely made the party feel cheery and all on a budget! Stay tuned as this is just the beginning of my Frozen Fever party reveal! Cannot wait to share the rest of the party….coming soon! Be sure to follow Raising Whasians via Facebook, Twitter, Google, Instagram, Pinterest and YouTube for family-inspired crafts, delicious recipes, travel and more! The banner is adorable, would be fun making it with my grandchildren! This looks like a lot of fun! I’ll love doing them in different colors too! So creative and something different from a lot of frozen themed birthdays i have seen. The sunflowers are so cute. Thanks for sharing! I love the sunflower banner but I’m not making the connection. Did I forget something about the Frozen movie? this looks cute. my favorite niece also like anything connected with disney princesses so I’ll gonna try it with her. thanks for sharing this great idea.